Violet Herbs is what we call an alternative dating spot if you want to do away with the crowd and pretentious vibes at posh establishments. Conveniently located at Tanjong Pagar, this modern semi-fine dining restaurant is within walking distance from the train station. The restaurant occupies the entire three stories of the shophouse unit along Tras Street – with the first two floors for dining, and a rooftop herb garden where fresh produce are used for the cooking. Helmed by Chef Edward Hoe, Violet Herbs is one of the most underrated restaurants in Singapore that offers splendid 3-course set lunches (S$33+/pax) and 4-course set dinners (S$58+/pax) at very decent prices that feature high quality and intricate plating. The main courses are also nothing short of impressive. Mark Violet Herbs down – it should be your next romantic lunch/ dinner spot. Chef Edward Hoe runs the show in Violet Herbs’ kitchen. He who was part of the pioneer team that spearheaded Restaurant Ember has 20 years of culinary experience, and at Violet Herbs, traces of familiarity are evident from the restaurant’s star dishes. Chef Edward was the head chef in The 2nd Floor-The American Club, as well as Greenwood Fish Market & Bistro. The menu boasts a good range of appetisers that include both hearty and light options. Lighter options include the Basil Pesto Salad (S$18) and one that we thoroughly enjoyed – Pistachio & Herb Crusted Scallops (S$18). The scallops were wonderfully plump and we liked the textural distinction between the soft juicy scallop flesh and the crunchy outer layer of pistachio and herbs. The dish is complete with tasty butternut pumpkin puree, bisque gel, parma potato chip and chocolate soil. This dish deserves a star for its presentation too! Guess what we love most about Violet Herbs’ appetisers? The variety of foie gras options from Roasted & Poached Foie Gras (S$24) and Truffle Foie Gras (S$26). We are usually unimpressed with lobster bisques because they are more often than not fishy or artificially flavoured. But the Lobster Cappuccino & Brandy (S$16) at Violet Herbs is easily the best we’ve tasted in recent times. The bisque was so intensely flavoured – the sheer sweetness of fresh lobster coupled with brandy is a feat in itself. With every scoop, we became more and more addicted. This is one stellar soup. With so many interesting mains to choose from, it will be one of those I-can’t-decide-because-I-want-everything-from-the-menu moments. We started with Violet Herbs’ bestseller – the Marinated Red Miso Cod (S$39). It is an a la carte main, but can be a top-up option in the dinner menu. The cod cooked to a glistening glory with a miso marinate was spot-on. With a side of roasted pumpkin puree, almond eggplant and some dehydrated parsnip chips, this stunning dish is a combination of healthy veggie goodness and fresh white fish presented in varying textures and colours. Even if you are not the biggest fan of lamb, we still urge you to try the Colorado Lamb Rack (S$48). Of course, besides the fantastic medium-rare cook on the lamb, it was the simple marination itself that made it so tasty with every bite. It also comes with mini pistachio foie gras roulades that you can choose to eat with the meat to cut the richness. Duck Confit is something we have to try if we see it on a menu, and of course, we tried the one at Violet Herbs. 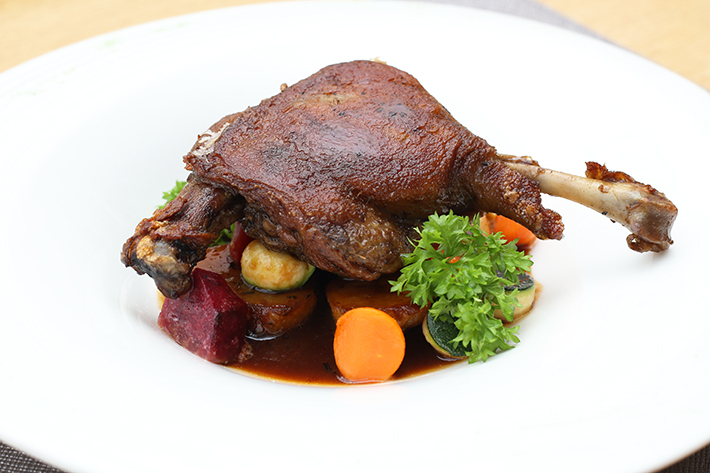 The Sous Vide Duck Confit (S$36) has a crackling outer crust and the most tender duck meat inside. The duck jus reduction that accompanied the duck was just right. We also liked how the duck confit is placed atop a bed of rustic vegetables of herb potatoes and sautéed baby spinach. Feeling really hungry or looking for something hearty? The Sous Vide 48 Hours Wagyu Beef Cheek is for those who are after something more robust. The beef is fork tender, has a sweet red wine glaze, and is jazzed up with Sardinian fregola sarda and zucchini spheres. In the pasta menu, you can find dishes such as Homemade Butternut Squash Gnocchi (S$42) and Lobster Risotto & Fregola Sarda (S$44). These aside, you should go for the Ebi Angel Hair Pasta (S$38) if it is your first trip to Violet Herbs. The pasta is cooked to a beautiful al dente, then tossed in lobster essence, rayu oil and bird eye chilli (or as we call it, chilli padi). Using only premium air-flown Japanese sakura ebi, the pinkish-red dried shrimps are sweet and crispy. That’s all we need for our pasta, really. Some desserts to expect here include Yam Strudel (S$12), Chef’s Special Tiramisu (S$16) and Triple Chocolate Mousse Cake (S$16). However, our heart was stolen by the Frozen Nougat (S$14). The dessert comes with little bits of lychee sorbet all around that complements the nougat with varying sweetness. Also, being huge fans of chocolate-anything mean we couldn’t miss the Valrhona Chocolate Fondant (S$16). The surprise of this dessert lies in the fact that it comes with truffle oil – an unexpected ingredient that actually makes the dessert even more fragrant. Violet Herbs has superb set menus for lunch that is priced at S$33 per person, and that includes a total of three courses. To sample Chef Edward’s signature foie gras dishes, you have the option to upgrade your set menu appetiser to a foie gras (+S$7) of choice. It is little wonder Violet Herbs is such a popular lunch spot, especially for business luncheons. Such value for money; we can all do away with the lunch hour rush and noise everywhere else, and embrace the cosiness of Violet Herbs with an intimate lunch. Dinner degustation menus begin from S$58 per person. Now, that is practically impossible if you want some fine dining. A typical main at fine dining establishments would usually start from S$40 already! But at Violet Herbs, the degustation menus begin from S$58 for a 4-course meal. If you are looking to host your events and/or plan your company gatherings here, you can also have a menu personalised for you. Private rooms are also available, else if all else fails, we say book the entire second level – which is the prettiest spot at Violet Herbs that is more than befitting for events of all sorts. For more information and reservations, call +65 6221 3988. This post is brought to you by Violet Herbs.